Written by leading authorities in their given fields, each volume in Oxford's acclaimed What Everyone Needs to Know® series offers a balanced and authoritative primer on complex current event issues and countries. Popular topics include International Politics, Environmental Policies, World History, Sciences & Math, and Religion & Spirituality. The concise question-and-answer format is ideal for college students, professionals, and inquiring minds alike. With the 2018 US midterm elections quickly approaching, it’s important that Americans feel prepared to enter the voting booths. To help our US readers feel better prepared on election day, we created a quiz to test your knowledge on key political issues. 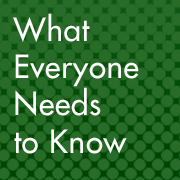 Referencing a selection of titles from our What Everyone Needs to Know® series, we collected questions about a variety of topics, including climate change, healthcare reform, and the news media. Take the quiz to find out what you need to know more about before November. Featured image credit: Question Doubt Problem by Tumisu. CC0 via Pixabay. This quiz says that a refugee is “a person forced to leave their native country for natural reasons”. Not only is that wrong, I don’t even know what it means. The quiz also claims that the US does not allow greater freedom of the press than other democracies. Since hate speech is constitutionally protected in the US but not in most of Europe, I believe this is also wrong.